Municipal building design projects are often fraught with numerous stakeholder groups. Sometimes these groups are at cross purposes and have different agendas to put forward. The “magic” lies in gaining input and buy-in from local elected officials, neighborhood businesses, state agencies, environmental groups, and so many more. In the case of the Madison Water Utility Paterson Street Operations Center, we had one of the largest and most diverse group of stakeholders I’ve ever worked with. I’m pleased to say that by the time we delivered the new building, everyone was proud to say they were part of the outcome. The Madison Water Operations Center Facility has been a part of the Marquette neighborhood for more than 85 years. The building was too small, inefficient and in poor condition. It was difficult to maintain dump trucks, backhoes, and other large vehicles because of the low ceiling height and limited space. The workshop space was inadequate. Administrative functions were divided. The lack of space caused operational inefficiencies, deployment challenges and work safety hazards. The building had no front door, thus “turning its back” on the neighborhood. When Mead & Hunt started this project, the design team was keenly aware of the need for seamless integration within the neighborhood, as well as the need for community outreach. As a public project, we were ready to bring together ideas from numerous stakeholders. Safety, urban renewal and sustainability arose as key goals for the renovation, so that the water utility’s service and presence could continue for the next 50 years. To deliver an innovative, cost-effective solution while providing a lasting benefit, we needed to aggressively seek input. Our design was refined and improved as we gathered the thoughts, wishes, concerns and needs of the many stakeholders. It was a long process, but to deliver a design that met everyone’s needs, this was a vital step. Madison Water Utility employees ranged from office staff to mechanics and well operators. All 52 were able to provide input on what would make the building’s features and layout better and more efficient. We used listening sessions and group meetings to draw out new ideas, identify current problem areas and build a consensus that would become the vision of the project. The utility’s managers and supervisors helped us prioritize all the elements of this vision. Pre-design meetings with the City of Madison zoning and development departments helped smooth the process through public reviews, design reviews and permitting. Neighborhood City Alders talked to us about the future of the neighborhood and how to best enhance its character. During meetings with neighborhood organizations, the public shared community expectations, such as improving the pedestrian experience and sustainability in this urban district. Because we listened to their concerns and truly cared, our planned improvements were appreciated and seen as an investment to their community. I think it helped better position the water utility as an active employer in their neighborhood. The next steps were to shepherd the project through the public review process. This was followed by the approval process with city urban design, zoning and planning commissions. The Madison Common Council needed to give its approval. 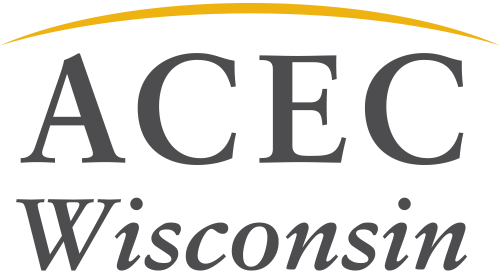 We then needed state sanctions from the Public Service Commission for public funding and Wisconsin Department of Natural Resources for stormwater management and contaminated soils. Once the design was complete, the project moved through permitting with the state and the city planning, zoning and engineering departments. The extra effort to involve multiple points of view from the various stakeholders was worth every step. Although there were times when I wondered if we would be able to meet every need and concern, in the end the numerous viewpoints proved invaluable for the success of the project. Today, this award-winning facility is a model for urban renewal. It showcases how industrial working environments can enhance a neighborhood. The new space has increased productivity for the staff and it meets their life-safety needs when working with heavy equipment. 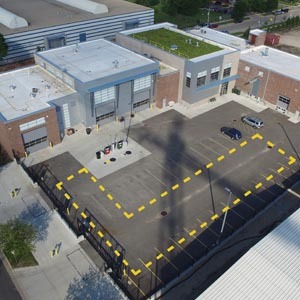 The facility’s openness and vibrancy also provides a new relationship with the area, as a good-steward of the neighborhood, environment and public service. The efforts toward sustainability, longevity and durability for this facility, contribute to a greener community while continuing the City of Madison and the Madison Water Utility’s endeavor to be fiscally responsible.